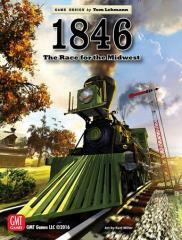 1846 - The Midwest railroad boom has gone bust, leaving in its wake hundreds of failed local railroads. Sensing opportunity in the economic vacuum, five large eastern railroads (The New York Central, Erie, Pennsylvania, Baltimore and Ohio, and Grand Trunk out of Canada) seek dominance west of the Alleghenies. Can you, as a nineteenth century tycoon, knit together these profitable railroads with the Midwestern remnants to form the most profitable rail network stretching all the way to Chicago or St. Louis?